Figure 1. This suite of untreated emeralds is from a new find in Ethiopia’s Seba Boru district. The largest faceted stone weighs 10.64 ct. The largest rough crystal weighs 63.12 g. Photo by Robison McMurtry, courtesy of Michael Nemeth Inc. In recent years Ethiopia has gained considerable attention in the gem trade for large amounts of high-quality opal from an area near Wegel Tena (B. Rondeau et al., 2010, “Play-of-color opal from Wegel Tena, Wollo Province, Ethiopia,” Summer 2010 G&G, pp. 90–105). Apart from opal, emeralds have been sporadically mined, near Dubuluk, for more than a decade. This deposit is located about 80 km from the Kenyan border. Gemfields has been exploring this deposit since July 2015 (Fall 2012 GNI, pp. 219–220). A new deposit of high-quality emeralds (see figure 1) has been found in the rural villages of Kenticha and Dermi, in the Seba Boru district (figure 2). In November 2016, author MN and business partner Daniel Kifle visited the local trading town of Shakiso, where Ethiopian gem merchants gather to legally buy and sell emeralds that are mined several kilometers away. Shakiso is located about 160 km north of the Dubuluk emerald deposit. The mining area is divided into a few “associations.” Each consists of a manager and several members who control the actual mining and distribution of the emerald rough. After the rough has been sorted, it makes its way first through Shakiso before being sold to dealers in the capital city of Addis Ababa, about a 12-hour drive from the mining area. Figure 2. The new deposit of Ethiopian emerald is located near the town of Shakiso, about 12 hours from Addis Ababa. According to Tewoldebran Abay, the mineral marketing director of the Ministry of Mines, Petroleum and Natural Gas, more than 100 kilograms of emerald rough have been produced to date. Mining still is done the traditional way using hand tools, without heavy machinery. Samples from the new deposit, acquired from multiple independent sources, were examined at GIA’s Carlsbad and Bangkok laboratories. Even though most of the material is commercial grade, lighter in saturation, and moderately to heavily included, fine gem-grade crystals of exceptional size, color, and clarity (see figures 1 and 3) are obtainable and can produce stones that do not require clarity enhancement. Many of the rough crystals were completely covered in dark biotite crystals, but had an extremely pleasant green color when examined with transmitted light. However, these Ethiopian crystals often do not yield large clean stones because their interior is riddled with dense, dark biotite mica crystals. Some show a double termination, but most are broken and heavily included on one end. Usually only one end of the crystal is clean enough to yield faceted gems. The matrix minerals attached to some of the emeralds were identified as dark brown to black biotite flakes, quartz, and kaolinite. Figure 3. 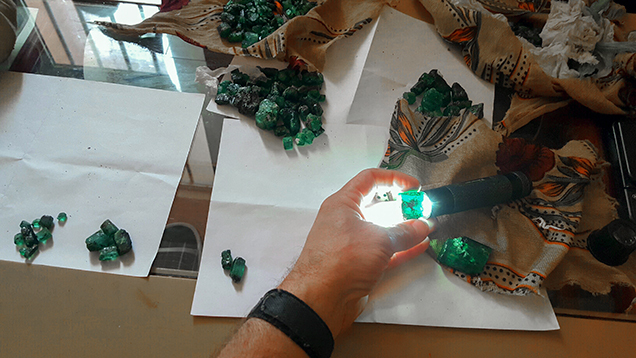 Author Michael Nemeth sorts through parcels of gem-quality rough emeralds from the open market in Shakiso. Rough crystals can weigh more than 20 g, with reports of some weighing almost 100 g. Photo by Michael Nemeth. These emeralds are very similar in appearance to other schist-hosted emeralds—in particular, those from Brazil and Zambia. 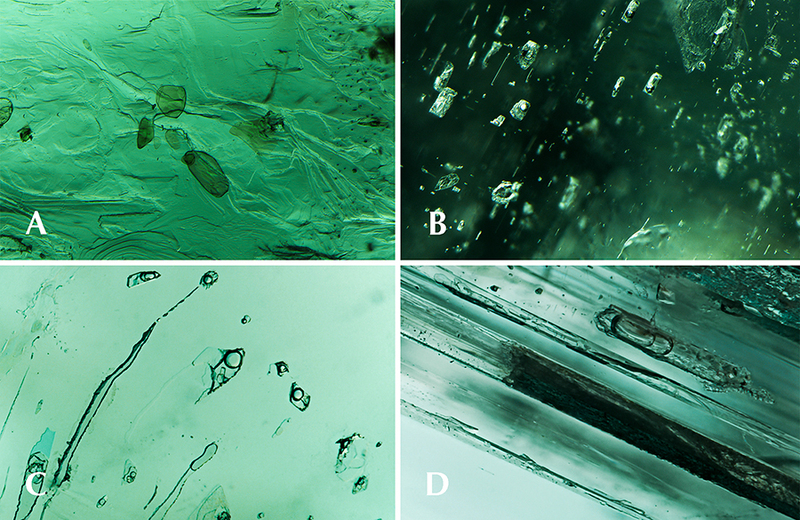 Among the faceted and rough samples examined, blocky multiphase inclusions and irregular biotite crystals were the most common microscopic features observed (figure 4). Otherwise, the gemological properties were very consistent with emeralds, including an average specific gravity of 2.73 and a refractive index of 1.581–1.589. 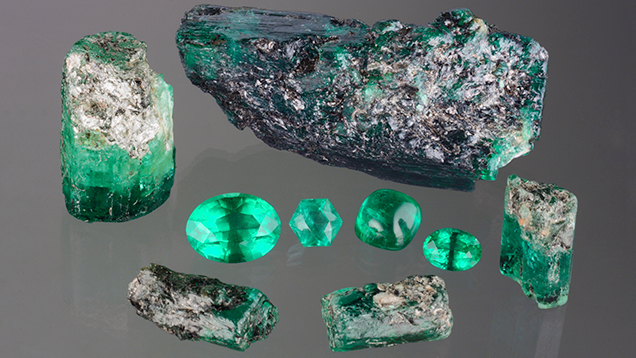 These emeralds were generally inert to long- and short-wave UV exposure due to their moderately high iron content, which is typical of schist-hosted emeralds. 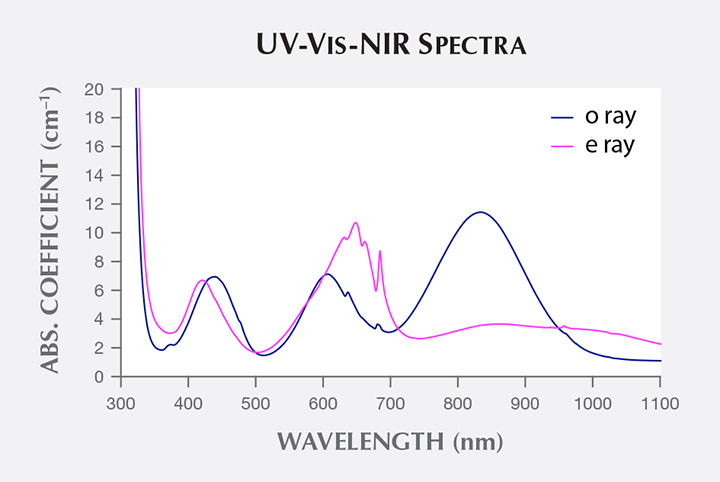 UV-Vis-NIR spectroscopy results (figure 5) were consistent with emeralds colored by chromium and vanadium. The Fourier transfer infrared (FTIR) spectrum was consistent with beryl, as expected, but did not reveal any other diagnostic features. Figure 4. Microscopic observation of the Ethiopian emeralds revealed (A) biotite crystals; (B) blocky multiphase inclusions; (C) multiphase inclusions containing a liquid, gas, and multiple daughter crystals seen parallel to the c-axis; and (D) a multiphase fluid inclusion showing liquid and gaseous CO2 phases and an immiscible aqueous liquid (parallel to this inclusion are several growth tubes). Photomicrographs by Nathan Renfro (A and B) and Victoria Raynaud (C and D). Field of view 2.04 mm (A), 1.79 mm (B), 1.07 mm (C) and 1.03 mm (D). Figure 5. 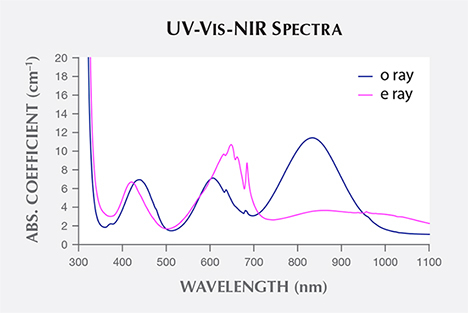 The characteristic UV-Vis-NIR spectra of the new emerald production from Ethiopia. Quantitative trace element chemical analysis was performed with a Thermo Scientific iCap Q inductively coupled plasma–quadrupole mass spectrometer combined with a New Wave Research UP-213 laser ablation unit. The analyses were compared to data from other known sources using GIA reference samples, including Zambian and Brazilian schist-hosted emeralds. Based on the results, it was possible to separate the new find of Ethiopian emeralds from other sources by comparing trace alkali metals and some transition metals (figure 6). Figure 6. LA-ICP-QMS quantitative trace-element composition analysis of alkali and some transition metals (measured in ppmw) proved useful in separating this new deposit of Ethiopian emeralds from Brazilian and Zambian schist-hosted deposits. Due to heightened tensions and fear of price instability, most of the mine area was temporarily closed by a joint effort of the mining associations and the local government from early November through December 2016. It has been reopened, but now all dealers, including Ethiopian dealers, need written permission to enter the Shakiso area for buying. The law is vigorously enforced, and penalties are severe. This exciting discovery in Ethiopia will provide a new source of large, high-quality emeralds for the gem and jewelry trade. So far, this deposit appear to be quite promising, as significant production was seen in the recent gem shows in Tucson, Bangkok, and Hong Kong. Only time will tell how significant this deposit will be. Nathan Renfro is analytical manager of the gem identification department and microscopist of the inclusion research department, at GIA in Carlsbad, California. Michael Nemeth is owner of Michael Nemeth Inc. in San Diego, California. Ziyin Sun is a staff gemologist at GIA in Carlsbad. Wim Vertriest is a trainee in the field gemology department, Victoria Raynaud is a trainee analyst, and Vararut Weeramonkhonlert is a colored stone analyst at GIA in Bangkok. 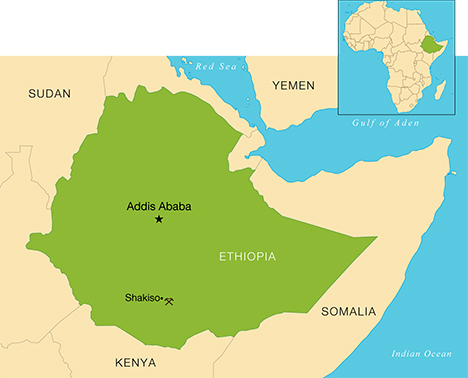 A new opal deposit was discovered in 2008 near the village of Wegel Tena, in volcanic rocks of Ethiopia’s Wollo Province. Zambia is considered the world’s second most important source of emeralds by value (after Colombia). Discusses the role of three-phase inclusions in emerald, in combination with spectroscopy and trace-element analysis, in determining geographic origin.